A Problem With Armour #GW2 #GuildWars2 – Nomadic Gamers, eh! The topic of armour (graphics) in any given MMO, especially armour for females, is a long and hard argument that comes up every few months. How on earth do women fight in that, look at how much skin is showing, etc. For the most part I’ve ignored both sides of the arguments because it’s a matter of personal taste and it’s so subjective that you’re never going to be able to ‘win’. 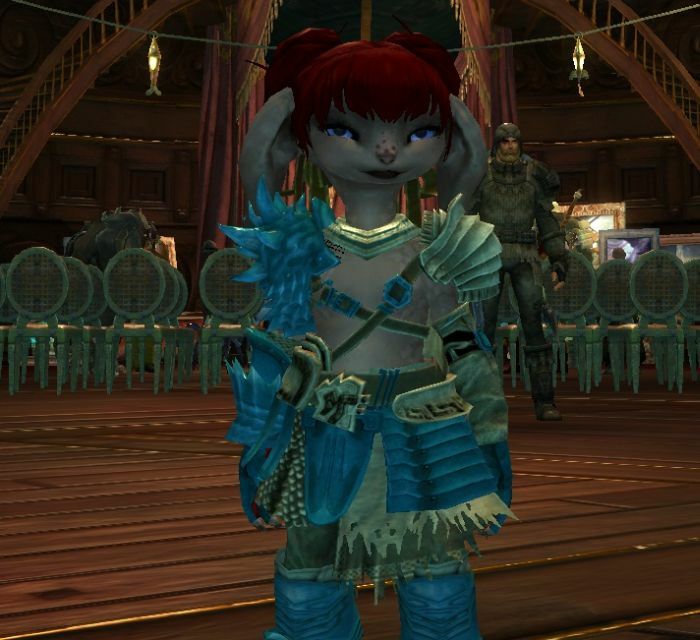 Then I got the breastplate above on my Asura. Purchased off of the trade post – hey ArenaNet, you need to be able to PREVIEW items before you buy them! See, that grey colour behind those seat-belt type straps, is my characters skin. Either Asura have no breasts, or there’s no need for any protection at all. In either case, something is hideously wrong with her armour piece. Every time I stare at the image, I want to adjust those straps. What exactly are they covering? NOTHING! The first thing I did after taking a few screen shots and laughing it up with the guild was run to my Hall of Monuments and re-skin the outfit with my GW1 HoM heritage gear. It would bug me to play a character who actually ran around looking like the above. I’ve no idea how this piece looks on everyone else, but please, gaming companies, keep in mind that not everyone is a human-type character, and some pieces just don’t look right on other races in your game. ** Side note ** because people seem to be confused as to my issue. My problem is with this specific piece, and how it looks on Asura. I don’t have an issue with ArenaNet and their armor, or their graphics, or anything else. That only happened because male and female Asura use male armor models. As male and female Asura have the exact same bodies. In general male armor tends to be the most concealing. Also the male armor models are universal to all races. So technically you got stuck with a really risque male armor. Stargrace – Love reading your posts and GW2 is fantastic so far! Most fun I’ve had in an MMO since playing EQ for the first time! I am on the Sanctum of Rall server and was interested in joining Combat Wombats. After reading your latest stuff the guild sounds fantastic and I am looking for a fun casual place to call home. Are you guys recruiting? Would I contact you in game to join in? That does look kind of odd on an Asura. Yeah, on my sylvari, it looked like a corset with a collar. *laughs* Now, I wish I had switched to my charr and previewed it on her! @Ettesiun No, you can’t preview from the trade post. @Paeroka You can’t link items from the trade post, but yes, I did link the item to guild mates before changing the graphic. I don’t think any of them saved the image, but now if I were to link it, it would have my new graphic (heritage armor) over top, instead of the one pictured above. From what I heard it was a corset type garment with a collar. I do not find the armor ugly or strange. Of course it does not protect the body, but this is not the first, it is not over-sexualising, I think it looks cool. Can you point more precisely what is your problem ? I am genuinely interested. Yeah that is a bit odd. Maybe they have a few armor models that are buged and don’t transfer over to female characters well?